A couple years ago I shared my original "Hipster Google" post, where I listed a collection of lesser known Google tools. The idea was to have some fun with the "hipster" theme, where something is cool because very few people know about it. Like a band that hasn't become popular yet, or a restaurant that is hidden away, or a style that is not mainstream. At that time I put together a collection of Hipster Google tools that weren't as popular as the "big ones" such as Gmail, Drive, Docs, and such. Even though these Google tools may have flown under the radar, they were still valuable for use in the classroom. Well since then, so many new unique Google tools have come out! I have done my best to grab these new tools as they came out and add them to my ever-growing list in Google Docs. However, I did not update my original blog post to share these new tools in detail. So I figured it was time for a new entry to share all of the awesome new Hipster Google resources! 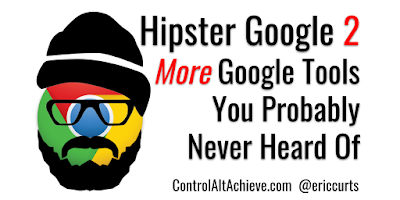 You can see the original list of Hipster Google tools in my blog post from a couple years back: "Hipster Google - Google Tools You Probably Never Heard Of". And below you can see a new collection of lesser know, but awesome, tools. As always, chances are you will have heard of some of these, but hopefully there will be a few new ones on the list for you to explore. If we all try hard enough we can get schools using these all around the world, and they won't be Hipster anymore. But for now they are, so put on your slouchy beanie and thick-framed glasses and have fun! We want students to work with real-world data. After they have collected data, analyzed the data, and drawn conclusions, we want them to be able to share their data in a manner that is engaging and conveys the information clearly. One tool that can help with that is Data GIF Maker. This simple website lets students pick between three type of graphs (Rectangles, Circles, and Racetrack), and then add multiple data entries. As a result, a cool animated GIF is created showing the data, which the students can link to or download and embed in their Slides, Docs, or other project. This can be a great way to let students explore interesting data visualizations, and improve how they share that data with others. Using artificial intelligence, Google identified and organized over 4 million images from LIFE magazine. 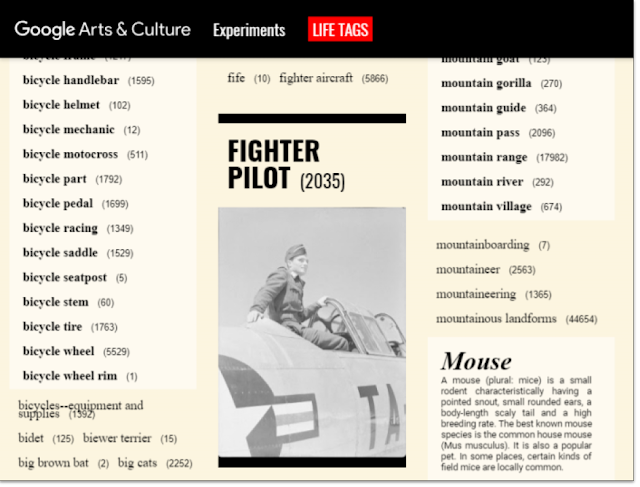 This allowed labels to be added to each image so they can be browsed by category or searched with key words. This massive collection gives students easy access to historical images from 1936 through 2000, which they can view, learn more about, and incorporate into their projects. When you have a question, sometimes coming up with the right search terms can be a challenge in itself. 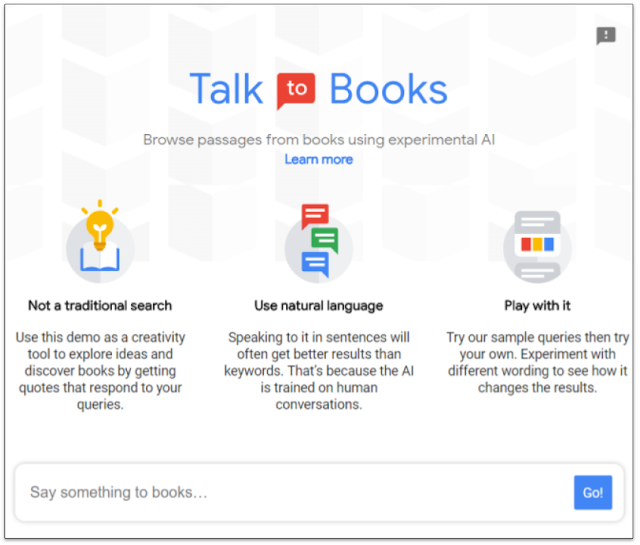 With "Talk to Books" Google is using artificial intelligence to let you ask natural language questions and then find you a response that would come next if you were having a conversation by pulling from sentences in over 100,000 books. You can then click on the response you like to jump right into that spot in the book to read more. This can be a valuable way for students to find books that address a concept they are exploring, as well as to find answers to questions they have. Students can add 360 images from Google Street View, or their own 360 degree camera, or with the Cardboard Camera app for their phone. For each location, you can also add descriptions, points of interest, image overlays, audio narration, and more. The final product can be viewed with VR goggles, on a phone, or on a regular computer. Tour Creator gives students an easy to use, but powerful, tool to tell a story, explore a historical event, or explain a concept. To learn more about this tool, see my detailed blog post "360 Degree Learning with Google Tour Creator". There are many ways for students to create "Choose Your Own Adventure" stories including Google Docs, Google Slides, Google Forms, and more. 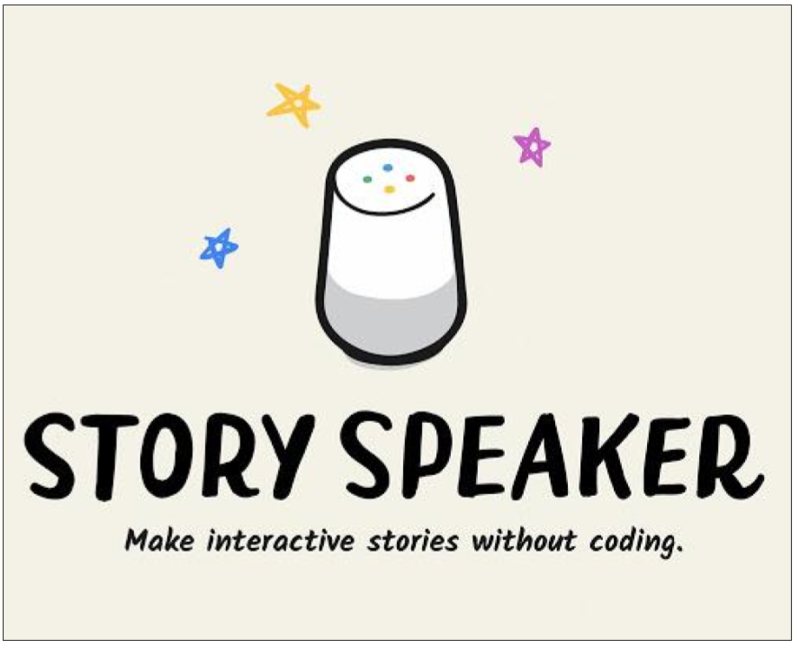 One really creative option is to use a Google Docs add-on called "Story Speaker". 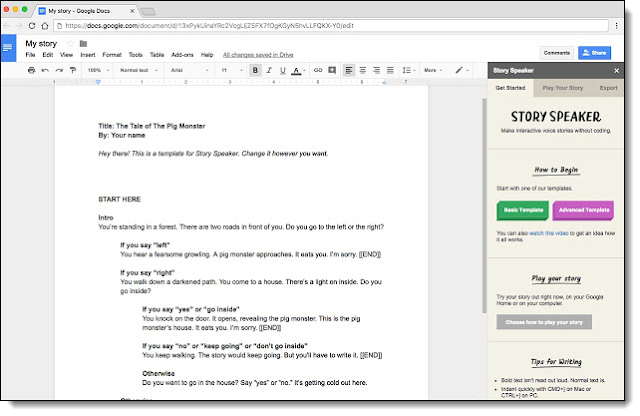 Story Speaker gives you a template in Google Docs so you can fill in your own story, choices, and branching options. You can keep it simple, or use the advanced syntax for more fun. 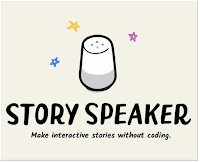 The final story can be played inside of the Google Doc, on a Google Home, or with the Google Assistant app. 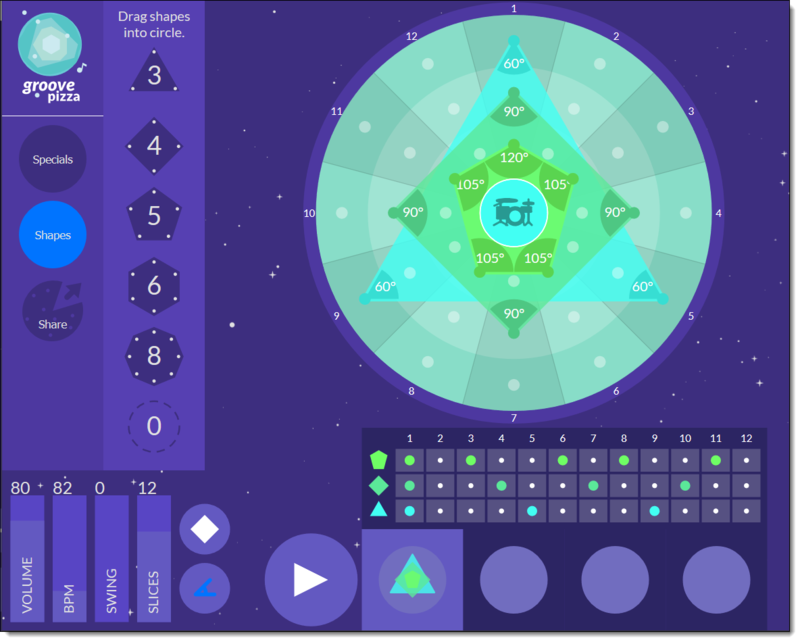 When played, the story will be read aloud, and the user can speak their responses to make choices. 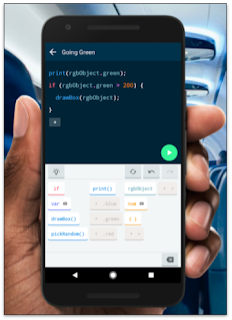 This can be an awesome tool for students to practice creative writing, plan out a branching story or review quiz, and learn a bit about syntax which can be a nice lead into coding. Sematris is a fun word game that is a vocabulary version of tetris. In this version instead of shapes you have words that fall from the top. You then need to eliminate words by typing in a word or phrase that best identifies that particular word, without using the actual word in your clue. Google's AI then tries to guess which word you meant and removes that block, along with any same colored blocks touching it. As the game goes on the falling words become more similar. This is a fun game to help students expand their vocabulary, while working on selecting precise words and phrases to best define a word. "OK Go" is a rock band that makes endlessly creative videos for their songs including one with a Rube Goldberg machine, one with weightlessness, and even one where they play a song with a driving car. This resource is a great way to integrate technology and inquiry into math, science, and art lessons, while engaging students in creative activities. Applied Digital Skills is a free digital literacy curriculum, with over 150 hours of content, for upper elementary, middle school and high school students, as well as adult learners. The practical lessons focus on accomplishing a task and solving problems that relate to everyday life, like budgeting for a purchase, creating a resume, doing a college search, or planning an event. The curriculum is all project based learning, and has short instructional videos for each lesson, so everything that is needed is ready to go. Teachers can use all of the curriculum or just pick and choose the lessons that fit into their subject area. 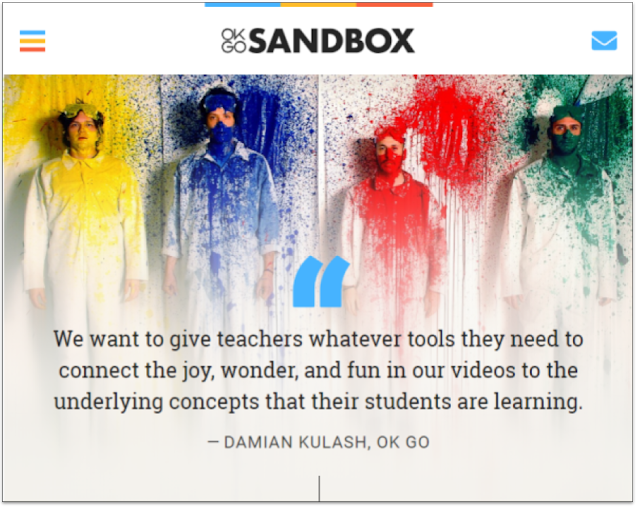 This is a fantastic resource for teachers who are looking for practical, technology integrated lessons that are ready for use with their students. These can also be used for adults as self-paced professional development. 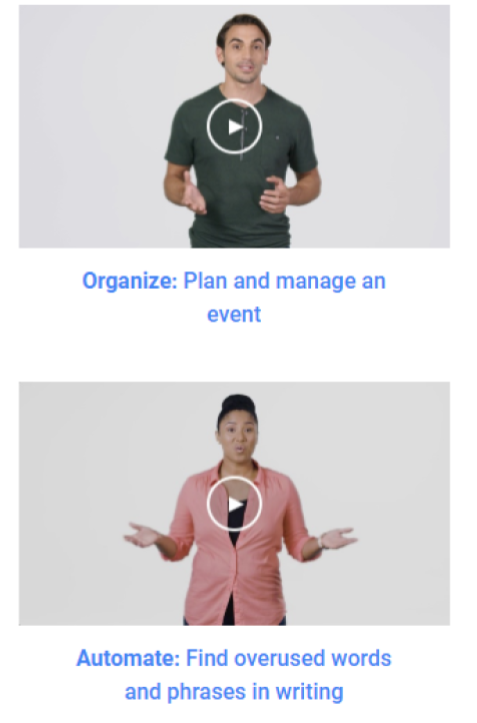 Similar to Applied Digital Skills, Google's Digital Garage is also a video-based curriculum. The main difference is that it focuses on adult learners and skills for growing professionally in your career or business. This is a useful resource for educators or older students to develop career skills. 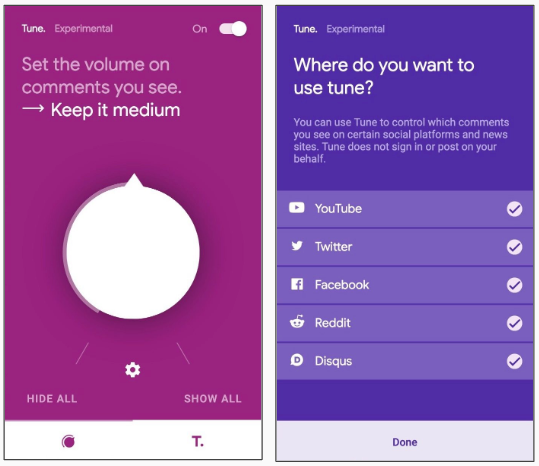 Although the name may make this sound like a music tool, Tune is actually an experimental tool to make your online experience more pleasant. As we all know, there are a lot of different opinions online, and this diversity of thought is one of the most beneficial aspects of a global community. However, sometimes the comments shared online can become toxic, attacking, insulting, and profane. Tune is a Chrome Extension that allows you to control the level of toxicity in the comments you view online for such sites as YouTube, Facebook, Twitter, Reddit, and more. You simply turn the dial in the settings to adjust which comments you see, all the way from full comments to no comments in "Zen mode", and everything in between. Using AI, the extension hides comments that are more toxic than the level you set, but always with an option to click on the comment to see it if desired. This tool could be an interesting option to allow students to benefit from social websites, while filtering out some of the harmful and hateful content. Although not a total solution by itself, Tune may be a useful tool in a broad collection of resources for digital citizenship and wellbeing. There are a lot of online tools for drawing, diagramming, and annotating. However, sometimes you just need something simple and quick. Chrome Canvas is a great match for that need. 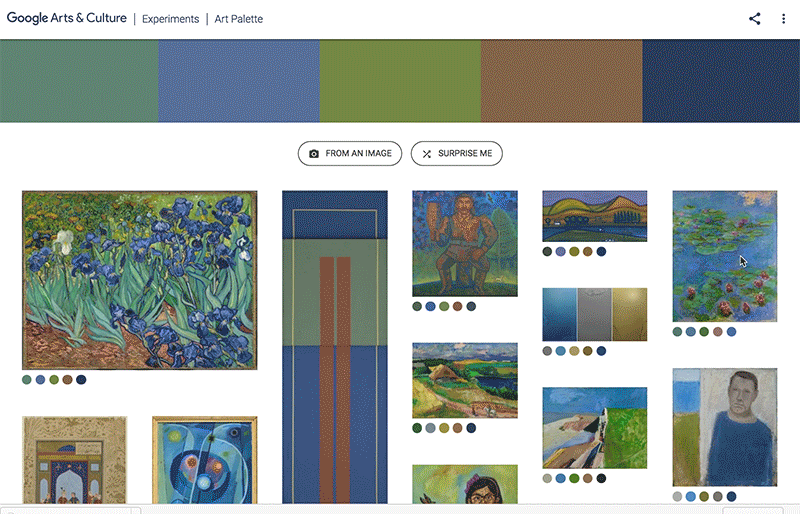 Start with a blank canvas or you can upload an image to draw on top of. Draw with a pencil, pen, marker, or chalk, in a variety of colors, or erase what you have drawn. Export your final product as a downloadable image. Anything you make in Chrome Canvas is automatically saved to your Drive. This can be a quick and easy tool for you or your students to make a diagram, annotate on top of an image, write out a problem, draw a picture, or more. This can be a useful tool to help students dissect a song to understand better how each instrument or track contributes to the whole song. 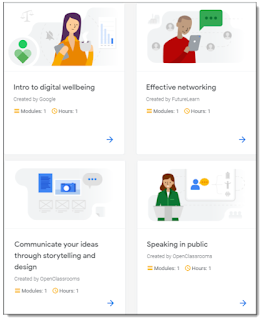 Google just keeps making more and more tools that can be useful for teaching, learning, creating, and more. 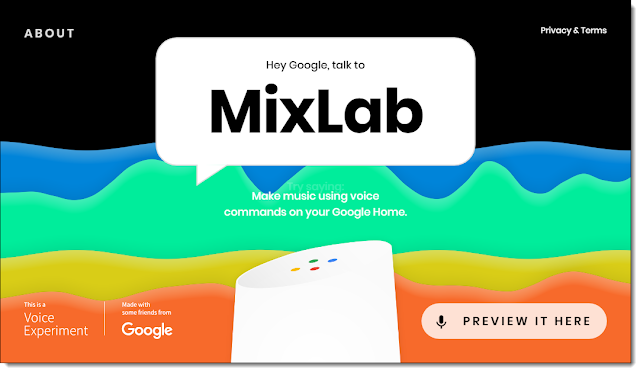 Many time these tools can get missed, and become Hipster Google tools where few people know about them. Hopefully this post has helped highlight many of these tools, and you have found a few that are new to you and beneficial to your students. As new tools come out I will continue to add them to my list, and eventually there may need to be a third post in this series. If you come across a lesser-know but useful Google tool, please let me know! You can share any ideas and resources in the comments below. Wow! As always, a wonderful presentation. Amazing! Love it!!! Thank you!!! Thank you for compiling this incredible list of sites. I sincerely appreciate your comprehensive explanation and vivid examples. I look forward to sharing this with my technology applications students. Mr. Hipster is referenced in the last slide and now I'll add Hipster 2. Thank you for this! I thought I was up to date until I read your post. Appreciate the curation! Thank you! I look forward to getting your emails. Never disappointed in anything you share. EC - You are the man! Keep up with the great work of helping educators around the globe.